As soon as I found out I was pregnant with baby number three I started thinking about what I would like to make. 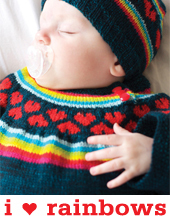 This babe will have a lot of hand-me-down knits from Hunter and Jones, a wardrobe of sweaters, booties, and hats. 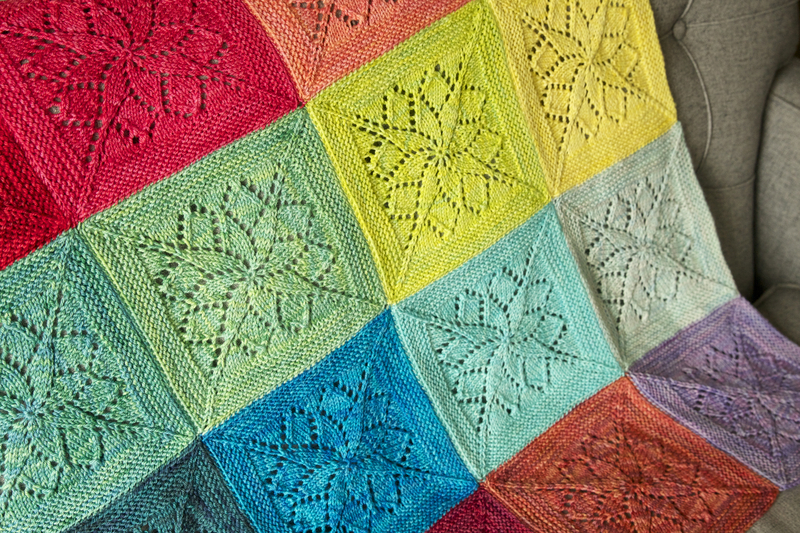 I decided I wanted to make something bright and beautiful so I went to my stash of rainbow Tanis Fiber Arts yarn and cast on for one of my very favorite patterns: Vivid! I know, it seems really crazy to knit the same blanket twice (I knit this one a little while ago). Especially something with so many of the same square but friends, I am completely and hopelessly in love (obsessed) with this blanket. 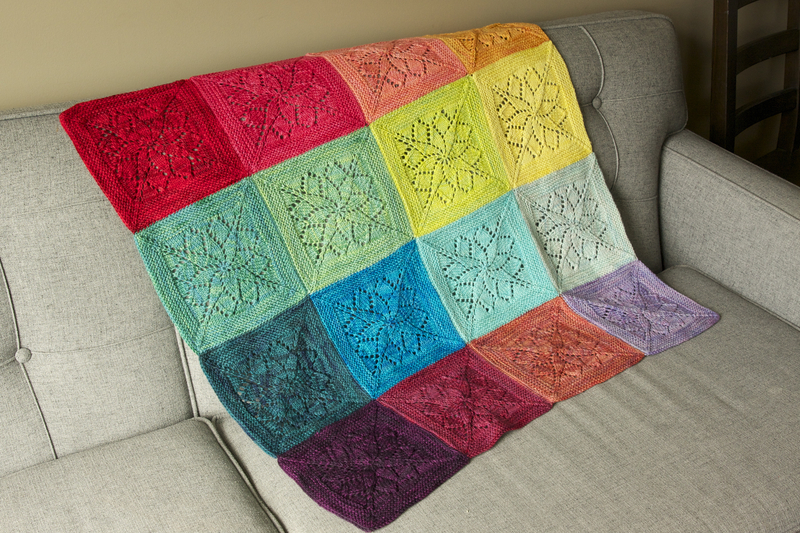 I have the pattern memorized, I can work a square in an hour or less, and doing each square in a different bright and beautiful hand-dyed color?! Nothing makes me happier. I’m a simple gal. I didn’t even want to use a different yarn, I picked up a few more colours in Tanis Fiber Arts Yellow Label DK and away I went. Now, no matter how smitten you are with pattern, there is always something you don’t want to do and for me that was seaming. 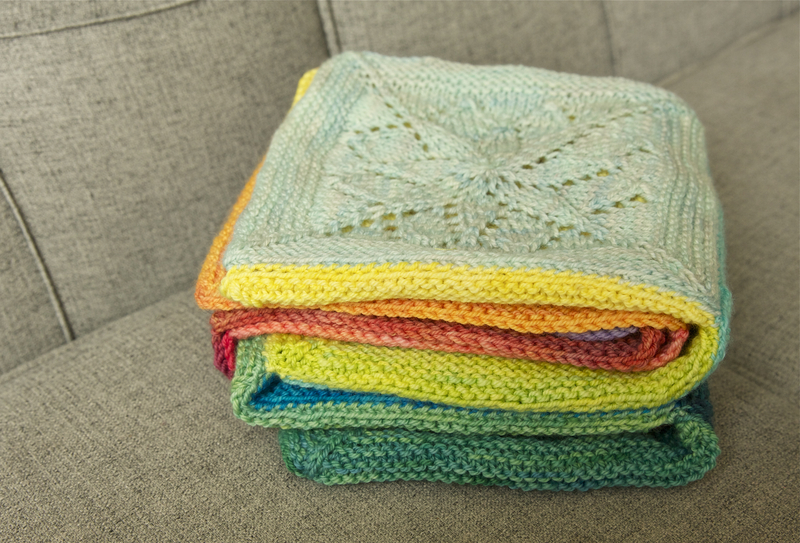 I finished these squares about a month ago and I’ve had them sitting, blocked and ready, in a neat rainbow pile on my desk. I pat them and give them a smile whenever I’m in my office, the palette makes me that happy. Last night I finally decided that they were not going to magically seam themselves as I had hoped and I got out my darning needle. The finished results still make me happy and the blanket is the first in a wee pile of new knits for babe number 3. Looking for a tutorial? Check out our in depth Vivid tutorial here. 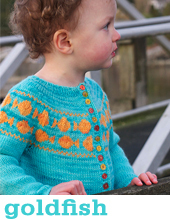 So I can’t be the only one who is obsessed with knitting a pattern repeatedly…can I? What’s your pattern obsession? I have loved this since I first saw it a year ago. I FINALLY had a friend have a baby so I had an excuse to make it, lol. I am in the process of making squares. I’m not too worried about the seaming, one or two a day, and in a week or so it will be done. So excited, love mixing colors! Reblogged this on Two Crows and a Squirrel. what an amazing palette! beautiful. That’s gorgeous. A friend just gave me a huge bag of lovely different colours of wool 4ply. Maybe this is what I need to do. Soooo gorgeous!! I don’t mind seaming, and I’ve just added this to my queue- I think I’ve developed a nice DK stash that would make a perfect Vivid blanket. All the FOs I’ve seen of this are stunning- and your newest one is a knockout. I love the palette! This is such a gorgeous pattern! Why wouldn’t you knit it twice?! Seaming is definitely the worst part for me too. I’m currently obsessed with baby blankets so I think this might be my next one! So beautiful! I love this. So worth the evening of seaming! Congratulations! The blanket is beautiful. You’re not obsessed with the pattern, just wonderfully in love with it. And why not be? Your results are beautiful. Absolutely beautiful! My obsession right now is tank tops and shawls/cowls. Gorgeous! I love the colors and the pattern. Since I am also a quilter, it looks like a beautiful quilt too. 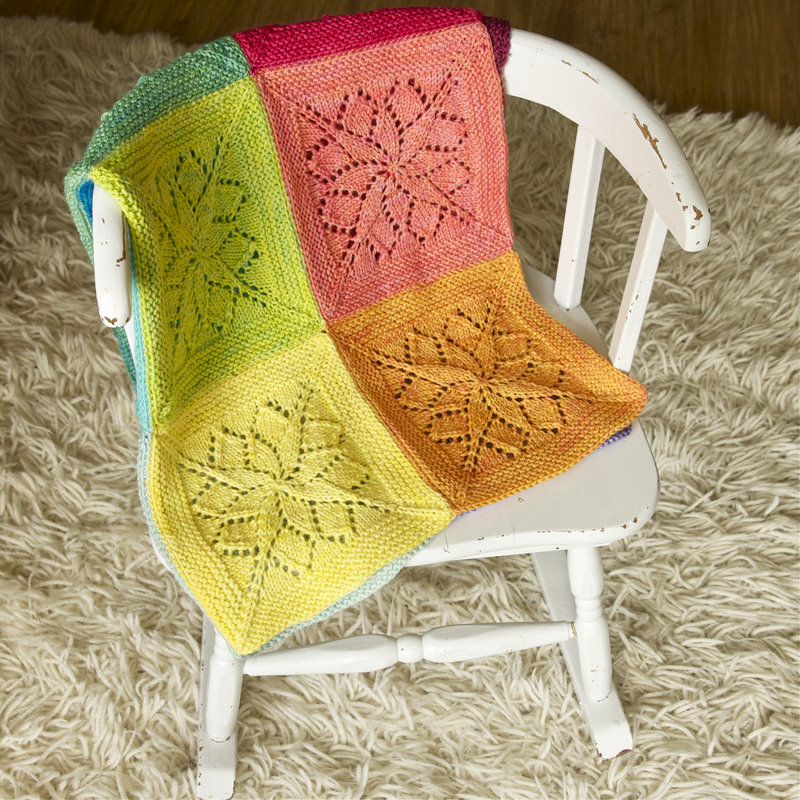 No wonder you’re obsessed with this pattern, it is such a lovely blanket! I can image it in neutral colours, in shades of blues… I tend to obsessed with patterns too, once I found something I like, I knit it repeatedly: one for me, one to gift away, another one for me, a different colour, a different yarn texture… Your blanket is now on my ToKnit list. This is a lovely blanket. I also like repetition as it allows me to “think” and put things to rest. However, like you I am not fond of seaming. 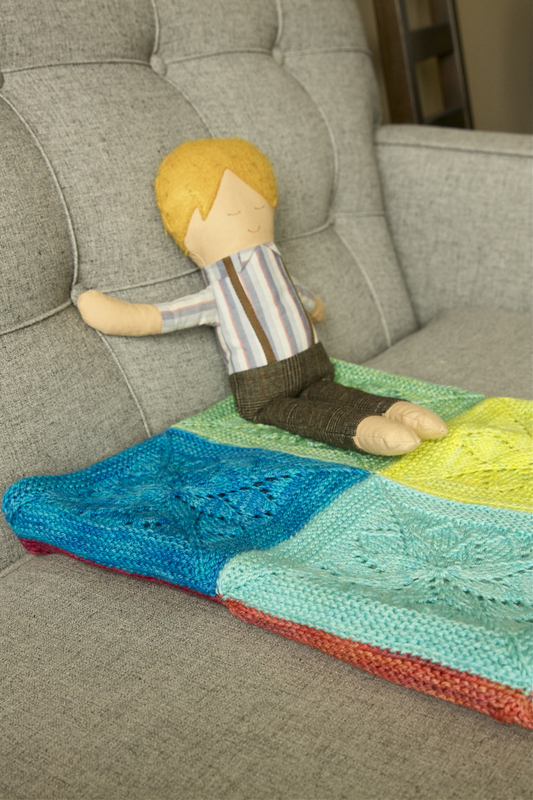 This blanket would definitely be worth the seaming, though. Thank you for sharing the lovely pictures. Thanks! The seaming took 3 hours, so a movie and a bit, not too bad at all!